Maria Castaneda was first elected Secretary-Treasurer of 1199SEIU United Health Care Workers East in 2007, and has twice been re-elected. She holds the second highest position in her union, representing over 400,000 healthcare workers in New York, New Jersey, Massachusetts, Florida, Maryland, and the District of Columbia. Maria is the highest ranking Asian American woman labor leader in the United States. Born in the Philippines, Maria migrated to the US in 1984. She worked as a volunteer community organizer in New York, assisting Filipino nurses with their immigration issues and helping promote Philippine cultural heritage. She lobbied for the Nursing Relief Act that granted thousands of Filipino nurses permanent resident status and family unification. She began working for 1199SEIU in 1985 as an organizer in the Registered Nurses Division. In 1998, Maria was a Vice President of 1199, representing the 5,300 members at Montefiore Medical Center in the Bronx. Seven years later, she was elected Executive Vice President, representing 1199 members at Montefiore Health System, Continuum Health Partners (now part of the Mt. Sinai Health System), Maimonides Medical Center and Lutheran Health System. Maria has also helped to forge a different model of labor management relationship – the strategic partnership. This partnership focuses on quality patient care and worker engagement. Under her leadership, hospitals reduced acquired infections by engaging frontline workers as quality coaches; increased patient satisfaction through care teamwork; reduced wait time in clinics; improved prep time in operating rooms; and carried out other successful initiatives. These joint labor-management initiatives give frontline healthcare workers a voice and input in promoting quality and safe patient care and services, and promote employee job satisfaction. Maria also led the labor-management Training and Upgrading program for union members. This program provides career ladders for healthcare workers through skills enhancement and continuing education. For example, a Certified Nurse Aide can train to become a Licensed Practical Nurse and eventually, a Registered Nurse. Service workers are trained to become Surgical Techs, clerical workers become certified billers and coders and so on. Within 1199SEIU, Maria leads in promoting a culture of health and wellness among members through workplace wellness programs. Members and the employers are engaged as wellness champions and help foster healthy eating choices, exercise and smoking cessation to combat chronic diseases such as obesity, diabetes and hypertension. Maria is a Vice President of the 2.1 million-member Service International Union. 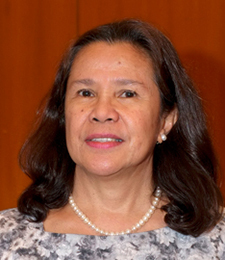 Last year, she formed the Haiyan/Yolanda relief work group, together with other SEIU leaders. The work group raised almost $600,000, and another $1.3 million worth of food, medicines, infant formula, water, and wipes. The work group partnered with NGOs in the Philippines and funded agricultural, livestock and fishing projects – including the rebuilding of a fishing landing and trading center – and rebuilding health centers, day care centers and a sewing cooperative. They also donated hospital emergency-room beds, nurses’ scrubs, and mattresses, bed sheets, and pillow cases for nurses who had to sleep on hospital floors. Previously, after the earthquake in Haiti, Maria helped form the 1199SEIU We Care for Haiti committee, through which the union donated over a million dollars for UNICEF to support Haiti’s children.